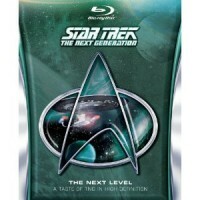 Startrek the Next Generation Sample Blu-ray Blu-ray Review. Also the episodes here don’t represent the best of the series. “Encounter at Farpoint” in particularly is terrible. Only “The Inner Light” stands up as a great episode. Still I suppose if we’d been given “Best of Both Worlds” or “Chain of Command” they’d be frightened that we wouldn’t by the series. Nonsense of course, but here we are. One of the most expensive series at the time, TNG cost more than a million dollars an episode in a time where that sounded like a lot of money. It was also filmed and then transferred to video for transmission. It is this strange way of doing things that means that there will be no up scaling to bring TNG into High Definition, so restorers have gone back into the archive and painstakingly gone through film stock for the Blu-ray transfer, cleaned the negatives and transferred them to Digital. So what you are seeing is how the series was filmed. The optical effects have also been recomposited meaning that they have been rebuilt basically from the ground up from original elements. The sound has been re-done as well in DTS Master Audio 7.1. All in all this is an impressive boost for a series that has been looking a bit long in the tooth for a while now. Paramount have released a sampler Blu-ray to drum up support and whet our appetites. It contains 3 episodes. The first episode of the first series “Encounter at Farpoint” presented in its two hour telemovie format, the season 2 episode “Sins of the Farther” and the award winning “The Inner Light”. And they look stunning. The detail is incredible and it makes watching TNG a truly different experience from the DVD, but this is also a reminder that HD is not always your friend. More detail reveals more mistakes and the blurriness you got from watching the show on and old CRT off video tape often hides a multitude of sins, mostly to do with makeup. Whilst Worf and Data come off ok, other Klingons don’t fair so well. “Kurn” from “Sins of the Father” particularly looks like he’s going to Trick or Treat as a Klingon rather than being part of a proud and noble race. Also the episodes here don’t represent the best of the series. “Encounter at Farpoint” in particularly is terrible. Only “The Inner Light” stands up as a great episode. Still I suppose if we’d been given “Best of Both Worlds” or “Chain of Command” they’d be frightened that we wouldn’t by the series. Nonsense of course, but here we are. Audio: The DTS mix is a little odd, I have a good 5.1 set-up, admittedly not 7.1 but even so music sounded disjointed (particularly the theme) and dialogue sounded thin. Original stereo mix sounds fine. Video: Terrible as “Encounter at Farpoint” was, I watched it in rapture simply for the impressive visuals. Incredible. Special Features: An ad for the first season (as if you weren’t going to buy it once you had this) and a trailer for the featurette on how the remastering was done. This blu-ray taster will be available in Australia next month for around $40 however you can pick it up on Amazon region free for $9 bucks right now.